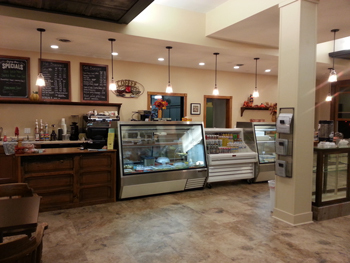 Stop in our deli for a carry out sandwich or bowl of soup for lunch or take one of our freezer meals home for dinner. In the warmer months enjoy outside seating for lunch or afternoon snack break. The selection of salads and desserts change on a daily basis in the deli so stop in often to see what we have. SOUPS: We have three hot soup selections daily in bowl, pint, or quart sizes. Our vegetable soup is vegetarian and offered each day. Many more frozen soups in quarts are available. For your own soup making try our salt free chicken or beef broth. FRIDAY FISH FRY: Hot carry out fish dinners are available from 11:00 AM-7:00 PM on Fridays in the deli. Two different kinds of fish are hand breaded and pan fried. Dinners include homemade coleslaw and tartar sauce, baked potato wedges, and roll and butter. Call ahead for a pick up time. ENTREES, SALADS, AND SIDE DISHES: These items are priced by the pound and change on a daily basis. FROZEN ENTREES: If you want to give your family a home cooked dinner, but just don’t have the time , our frozen meals are for you. All of our entrees are made in small batches and contain no preservatives or artificial flavorings. They are frozen in oven and microwave safe containers in two or four to six serving sizes. Just thaw in the refrigerator over night or defrost in the microwave and reheat. These also are great for new moms, senior citizens, college students, or thank you gifts. A few examples of entrees: Shepherds pie, vegetable or meat lasagna, chicken enchiladas, stuffed cabbage rolls, and Swiss steak. FROZEN POT PIES: By far our most popular item. Made completely from scratch in single serving or four to six serving size. Each flaky crust is hand rolled surrounding a thick meaty filling of either chicken or beef , vegetables and sauce. Bake from frozen and have a complete hot meal in one and one quarter hours!